Aug 5, 2015: Windows 10 Is HERE. ClipMate 7.5 runs just fine. The ClipBar works fine. 32 or 64-bit Windows. ClipMate 7.5 features both 32-bit and 64-bit ClipBar support in both Windows7 and Windows8 (and Windows 10!). It is a free update to all ClipMate v7 users. Just install over your current 7.3, and you'll upgrade it "in-place". Users of the WebRoot firewall will need to make an adjustment to the WebRoot settings in order to allow ClipMate to capture clipboard data from web browsers. Otherwise WebRoot will BLOCK such access! It may also be causing WHITE SCREEN CAPTURES as it may be blocking the PrintScreen key. ClipMate is named in Ed Bott's "My 10 favorite Windows programs of all time", saying "I figure it’s paid for itself many, many times over"
Without any shadow of a doubt the most useful AND user friendly utility I've ever come across (Qurb follows due to it's simplistic but effective performance). It has so much funcionality, and when things go wrong, I get a response from Chris Thornton. Now if you've ever had a problem with Windows, did you get a response from anyone, let alone Bill gates? ClipMate saves time and makes you more productive by adding clipboard functions that the Windows clipboard leaves out, such as holding thousands of "clips", instead of just one at a time. ClipMate has functions to combine, edit, and manage your clipboard data. It can also print, re-format, and even spell-check. It also has a multi-monitor screen capture, and has features for sharing clips among multiple PCs. ClipMate 7 adds powerful drag/drop, integration with the windows taskbar, and makes pasting your data even easier than before. Everybody needs ClipMate. Not sure how you'd use a clipboard utility? Visit the Why You Need ClipMate page. You'll discover why tens of thousands of users depend on ClipMate every day, and it's often the first program that they install onto a new computer. ClipMate runs on Windows XP, Vista, Windows 7, Windows 8, and Windows 10. A single-user/two-computer license is only $34.95 USD. You can buy now, read more, see some screenshots, or test-drive our free, 30-day trial. Visit our Trophy Case to see our awards and accolades. In 20+ years, we've earned quite a few! You won't find any "junk" awards in our trophy case, only real awards from people that matter! ClipMate Remembers everything that you cut or copy to the clipboard. It works with all Windows programs that work with the clipboard. Searchable database can hold THOUSANDS of clips, in Text, RTF, HTML, and Bitmap format. "Shortcuts" place commonly-used clips within easy reach for quick re-use. PowerPaste™ feature helps you quickly paste a series of clips, or break apart complex data by comma, linebreak, etc.. It's like a bulldozer for your data! Integration with XP and Vista taskbars for easy access, and visibility of the "top clip". Powerful re-formatting, editing, case conversion, and even a spellchecker! Easy to use! Just double-click on a clip in the clipboard history list (ClipList), and it's pasted right where you were working! Or, just drag/drop data right from ClipMate into the target. Use the "Portable" version to take ClipMate with you on any USB stick, including "U3 Smart" drives. For $34.95, our Single-User license covers you on two computers, or one computer and a USB stick. Our "Household" license covers up to 5 computers used in the same household for only $79.95, and multi-user licenses are available as well. Printing - Of course, you can print clips too! The new "paper-saver" feature in v7.3 lets you print several small clips (text or graphic) on a page, if they'll fit. Sharing - Sometimes you need to share data with a team or workgroup, or just "yourself" at another computer. ClipMate covers all the bases, with support for "live" multi-user databases, or distribution of clips and updates via XML files. Screen capture by desktop, window, or "area", with support for multiple monitors. Sometimes you just want to paste without all of the formatting that often accompanies clipboard data. Have you ever re-typed data from a web page because you didn't want to contaminate your document with tables and styles from some web page? If you press the Win+W key, ClipMate will "filter" the clipboard to be plain-text. It's fantastic! EXTENDS The Clipboard - ClipMate extends functionality of the windows clipboard by allowing you to keep an unlimited number of "clips" (clipboard history) for later use. Manages The Clipboard - You can quickly find, delete, sort, print, any of thousands of "clips". Any software program that can use the windows clipboard, can work with ClipMate. It's Free for 30 days, $34.95 to purchase a license for continued use of the software. Upgrades from ClipMate 6 start at $19.95. Platform Requirements: The ClipMate Clipboard Extender runs on Windows XP, Vista, Windows 7 (32/64*), and Windows 8 (32/64*) and Windows 10. It does not run on Windows mobile, Windows Phone, Windows RT, IOS, Linux, Mac, Palm, Android, iPhone, iPad, or PocketPC. Please don't ask about those platforms. *ClipBar Support for 64-bit Windows 7, 8, 10 is currently AVAILABLE in ClipMate 7.5, which ships with both 32 and 64-bit versions of the ClipBar DLL. 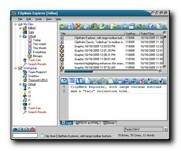 ClipMate was the first Clipboard extender for Windows, back in 1991. We've actually had versions 1, 2, 3, 4, 5, 6, and 7 with dozens of release in-between. We've been continually improving it for over 24 years, thanks to the tremendous support of our users. If you use the clipboard, you'll wonder how you ever got along without ClipMate. If you don't use the clipboard because it's not very powerful - now is the time to start! Are you looking for developer information? We have a page with clipboard "do's and don'ts", and information on writing clipboard software.